Facilitated by Mary Davies, Executive Principal of Maiden Erlegh Trust, and Joanne Harper, Executive Principal of UTC Reading and UTC Swindon, the conference consisted of leadership training and planning sessions for 2017/2018. Stephanie Mitchell, Director of Industry Relations at UTC Reading, delivered a session during the afternoon of the first day on the Career Mark, which assesses excellence in careers education, information, advice and guidance provision. Stephanie commented: "UTC Reading are aiming to achieve the Career Mark in the next academic year to show our outstanding quality of careers guidance. All members of the extended leadership team worked together in the conference session, culminating in a fantastic portfolio of evidence." 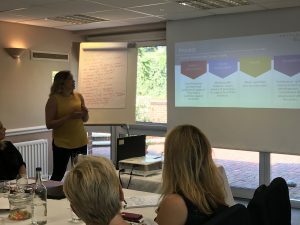 Stephanie also supported UTC Swindon in establishing their provision for the Career Mark, and has collaboratively worked with them to start their portfolio of evidence. We hope to see both UTCs achieving the Career Mark in the near future. Tim Buebird, Subject Lead for English and Languages at UTC Swindon, commented: "It was a really useful experience, with the opportunity to share both whole UTC and subject specific experiences with like-minded teaching staff. It was particularly rewarding to re-visit our UTC ethos, aims and objectives, and re-focus our attention on the core beliefs of UTC Swindon." Cimen Sahin, Director of Mathematics at UTC Reading, said: "It was an excellent conference which helped me to understand that different situations require very different leadership approaches. I will not forget the five leadership roles; 'thoughtful, motivator, connector, implementer and catalyser'. It helped me to think how to find the right role for my situation and how to achieve more." Nick Mitchell, Director of Teaching and Learning at UTC Swindon, said: "The conference was a great opportunity for collaboration and working with like-minded people where we could share our visions and address common challenges as part of a larger team."